Carswell Medieval House (Cadw) Historic HouseThe stone ruin of Carswell Medieval House currently stands amid a complex of modern farm buildings, once formed part of the estate of the earls of Pembroke. This two-storey gabled building is of solid rubble construction, with vaulted undercroft. The external staircase is no longer in evidence. 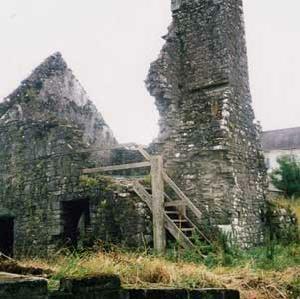 The stone ruin of Carswell Medieval House currently stands amid a complex of modern farm buildings, once formed part of the estate of the earls of Pembroke. This two-storey gabled building is of solid rubble construction, with vaulted undercroft. The external staircase is no longer in evidence. The house appears irregularly in the historical record, but is mentioned in documents from the fourteenth and sixteenth centuries. By the latter date the property appears to have been divided into two. 1 mile (1.6km) east of St. Florence, about 3 miles (4.8km) west of Tenby.